All he does is win! No matter what! After a rough start Tim Tebow came through when it mattered most…again! Trailing 13-10 late in the fourth quarter Tebow led a game winning 95 yard drive to give the Denver Broncos a stunning 17-13 victory over the New York Jets. On the final Broncos drive Tebow accounted for 92 of the Broncos 95 yards, culminating with a 20 yard Tebow touchdown run with 58 seconds remaining. 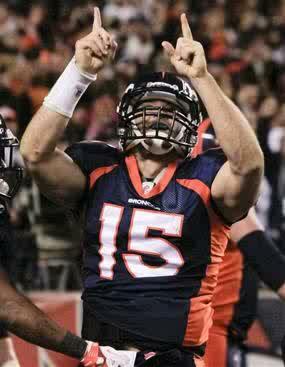 Tebow only completed 9 of 20 passes for 104 yards but rushed for 68 yards and the game winning touchdown.